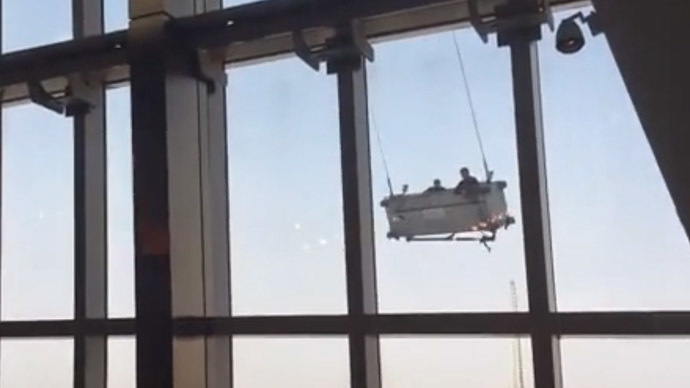 Window washers in Shanghai survived a nightmare worthy of a Hollywood action extravaganza except their 'stunt' was for real. The cleaners were 91 stories above ground, battered by a powerful wind. A group of window cleaners was cleaning the 91st-floor windows of the Shanghai World Financial Center. The video of their adventure was first posted on Weibo, a Chinese micro-blog service, on April 2 and uploaded the same day to YouTube. A minute-long, vertigo-inducing video captures the men being catapulted around as the wind whipped violently back and forth. Their hanging cradle is seen crashing into the building several times. According to the Shanghai List website, the platform eventually crashed into a window breaking the glass. While the workers reportedly sustained only minor injuries, the entire floor was said to have been evacuated. The Shanghai World Financial Center in China has 101 floors with 3 below ground. Its tip raises over 494 meters with an observatory located 474 meters above the ground. Before its opening in 2008, it was the second-highest building in the world. Today it ranks seventh.